Keurig K-Cup Storage Drawer 36ct Only $12.99 (reg. $49.99)! You are here: Home / Great Deals / Amazon Deals / Keurig K-Cup Storage Drawer 36ct Only $12.99 (reg. $49.99)! If you have a Keurig, then you know you need somewhere to store all those K-cups! 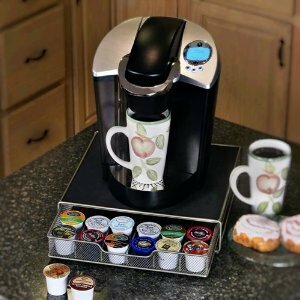 Head over to Amazon and get the Keurig K-cup Storage Drawer Coffee Holder for 36 K-cups for Only $12.99 (reg. $49.99)! This is perfect because it just sits right under your Keurig. Plus, you can get FREE Super Saver Shipping on orders over $35 or get FREE 2-day shipping with Amazon Prime.